It only comes once a year, and each time we all find ourselves scrambling to find mother's day plants to show how much we appreciate our moms. This is not always an easy task, especially when you’ve been buying your mom different plants for years. How to you come up with something original? Anyone can stop at a local garden center and pick up a plant, but have you ever tried to come up with something that will truly excite her? Roses: Roses are one such mother’s day gift that is often overlooked because we associate roses with valentine’s day, and other occasions for our spouses or partners. Roses however make excellent choices for mothers day plants. We are not talking about cut flowers in a bouquet mind you, but an actual potted planted that mom can appreciate for a few days indoors, and can then plant in her garden to enjoy for years to come. Roses tend to be a little more high maintenance than other mother's day plants, but if your mom is into gardening, then she most likely doesn’t mind a little pruning every year to keep the plant beautiful. If this sounds like your mom, then give her potted roses for her special day! Orchids: Orchids are exceptional mothers day plants that are sure to captivate mom, as well as anyone else who sees it. Orchids are one of those rare and exotic gifts that most people tend to overlook, or choose to, because of the price. Sure, they certainly are not the cheapest flowers you could choose to give, but orchids are widely recognized as a thing of beauty and what mom wouldn’t feel special to receive such an amazing gift? Orchids have very special growing requirements to bloom, but most places that sell them in finished pots can also provide you with the instructions on how to care for them. Given the proper care, these mother's day plants can continue to bloom for 8-12 weeks. It’s like a gift that keeps on giving! Tulips: Tulips are a common plant that is purchased around mother’s day because they are usually in bloom around that time of the year. Most nurseries and garden centers have long ago gotten smart about customer buying habits and have started forcing tulips and other bulbs during the winter months indoors, so that the plants are in full bloom for the week or two prior to mother’s day. 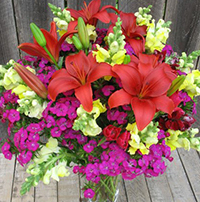 Bright, vibrant blooms are what attracts customers and who wants to give mom a plant that has no color to it yet? The downside to these kinds of mother's day plants is they are already nearing the end of their growing season by the time you purchase them, so don’t expect them to stay pretty for very long after. Don’t worry though, bulbs plants are perennials so they will come back next year if the bulbs are planted in the fall. 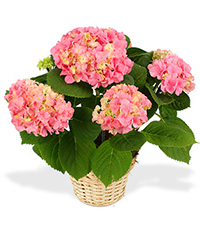 Hydrangea: Hydrangea plants are quite lovely plants that are often given as gifts on mother’s day as a potted plant. Hydrangeas have big broad leaves that when in bloom, are surrounded by just a stunning amount of colorful blooms. 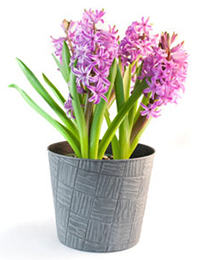 When purchased as a gift, the plant will be around 18 inches tall and usually comes in a nice pot or basket for show. Hydrangeas are early summer blooming plants that will also survive most winters with little care and the following year they will come back even bigger than before. Hydrangeas get very tall and wide if left unpruned, so these are a great choice for a mom who wants to transfer her gift into the garden so she can enjoy it year after year. Gardenia: Gardenias are very popular mothers day plants because they have a very delicate fragrance that typically appeals to most people. Their lush green foliage and colorful blooms provide a good contrast plant for most decors. 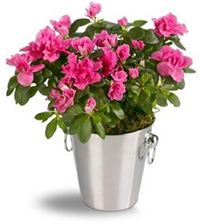 Gardenias as a gift plant are generally sold with a nice, classic decorative pot and tend to be around 12 to 14” tall. They usually cost a little less than roses, but you will pay a little more for them versus some of the more common bulb plants like tulips or daffodils. Bonsai: Bonsai trees are often widely overlooked and underestimated as a mother’s day gift. Initially a bonsai may seem an odd choice but if your mom is one who is creative and enjoys pruning and maintaining her garden and plants, then a bonsai might not be a bad choice. You can also turn other plants, such as gardenia into bonsai, and these are frequently sold as gifts as well. Not only is a bonsai a unique and interesting idea, but they do very well indoors if grown near a western or southeastern window. These mother's day plants will give mom the opportunity to put her creativity to work shaping and pruning the bonsai precisely the way she wants it! Succulents: Succulents are a rare and unique gift that is not often thought of for mother’s day. Because they are very easy to propagate and are very forgiving about their growing conditions, a basket of succulents is a gift that will get a lot of attention for not a lot of money. There are so many varieties of succulents available that every assortment is going to be unique in itself. 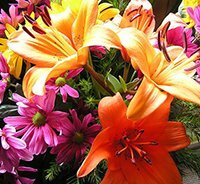 Lilies: Lilies are very popular mothers day plants and while they are not a terribly original idea, they are extremely beautiful plants that deserve a mention. Lilies are bulb plants, meaning they tend to be forced in greenhouses over the winter so they are ready to bloom for easter and mother’s day. You will have no problem finding just the right lily to suit your mom’s tastes. Topiary: The last mothers day plants we are going to mention is topiaries. These are plants that have been pruned and trained to grow like miniature trees. Azaleas are commonly turned into topiaries as they will bloom with a bright and brilliant canopy of color. Topiaries are usually tall plants and you will pay a little more for them because of the added work and growing time, but they sure do make wonderful gifts for mother’s day.